Grave’s disease is an autoimmune disease that causes your thyroid to produce too much T3 and T4 hormones. An autoimmune disease is your immune system attacking your own tissues, in this case, your thyroid gland. Since the thyroid hormones control and regulate so many systems in your body, the symptoms can be debilitating. This particular disease mainly affects women between the age of 40 – 55. Most people with Graves’ disease will have a swollen or enlarged thyroid gland (a goiter). Common symptoms include, anxiety and irritability, tremours and sensitivity to heat. Your periods may become irregular, your bowels loose and you may have unexplained weight loss. Some people experience a bulge and redness of their eyes known as Graves’ ophthalmopathy. In most cases your doctor will order a blood test to check your levels of thyroid stimulating hormone (TSH). 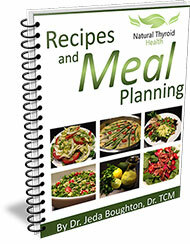 Thyroid stimulating hormone doesn’t come from the thyroid itself but from your pituitary gland. If your TSH is very low you will be diagnosed with hyperthyroidism and additional test will be run to determine if you have Graves’ disease. These may include a blood test for antibodies, a radioactive iodine uptake or an ultrasound of your thyroid gland. If you doctor is thorough she will also give you a physical exam to check if your thyroid gland is enlarged or your eyes show signs of ophthalmopathy. Your blood pressure and your heart rate should also be checked, because the disease ramps up your metabolism, these can be higher than normal. Many patients are treated with radioactive iodine or the removal of their thyroid gland. Radioactive iodine and thyroidectomy will destroy your thyroid gland causing a dependence on thyroid replacement hormone. Radioactive therapy can also trigger or aggravate Graves’ opthalmopathy. There are natural remedies that are effective in treating Graves’ Disease. It is important to balance your immune system and reduce inflammation since radiating or removing your thyroid does not eliminate the cause of the problem. Find an experienced natural health care professional that can help you address your specific needs. Hyperthyroidism Lab Values – Don’t Rely Solely on These Tests?